Do you really want to test your singing chops? 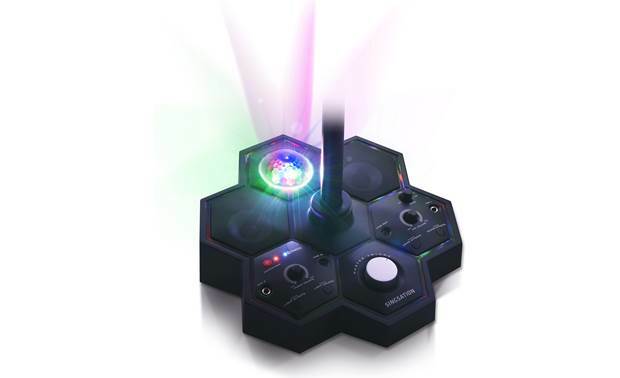 Try the Singsation Performer karaoke system. Do you really want to test your singing chops? 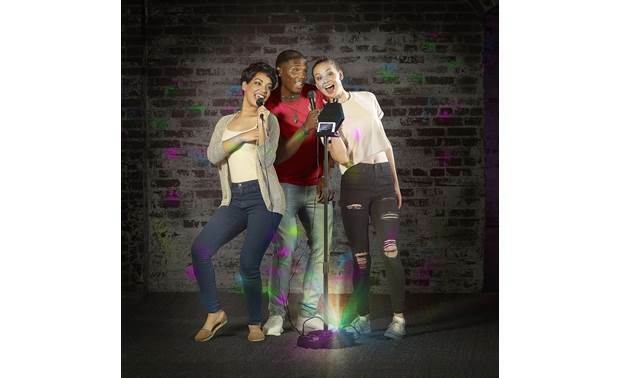 Try the Singsation Performer karaoke system. It includes the gear you need to make a real impression — or have fun trying. All you need to provide is your voice, your smartphone, and a group of friends to cheer you along. The Singsation Classic includes a microphone and floor speaker with an adjustable stand. Sing a cappella, or play backup music from your phone or tablet — you can use a 3.5mm stereo connection or connect wirelessly via Bluetooth. And you can play pretty much any audio out there. 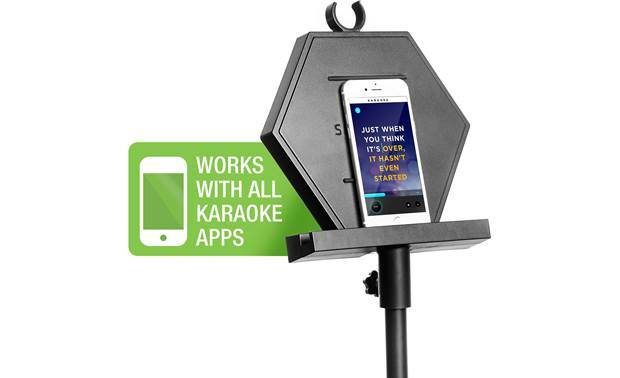 I've had good luck finding free karoake videos on YouTube®, but the Singsation Performer will work with most karaoke apps. 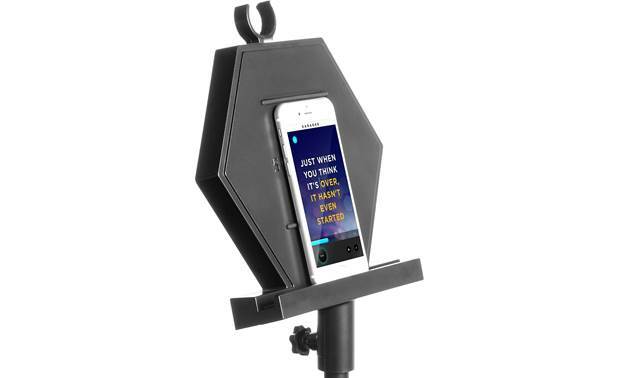 There's a cradle on the stand to hold your device, so you can read lyrics from the screen. In a pinch, you can put on a music service like Spotify®, and sing over the existing vocals. We all know good lighting can help set the mood, and you can choose from 16 color-changing light patterns. 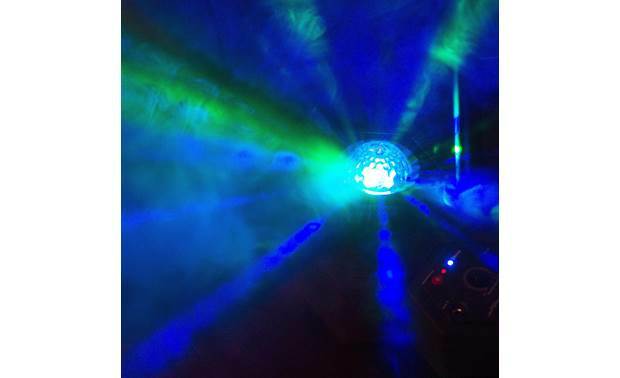 Go from "chill" to "rave" to straight-up "party" mode with just a few pushes of a button. Then throw in a few sound effects to really drive it home — I'm really feeling that air horn! Vocals get a boost too. You can add a second microphone (sold separately), and turn up the volume of your voice in the mix. Plus you can choose from 10 vocal effects, like "echo," "baritone," or "alien." Can you add a second microphone to this? Yes. It has two 1/4" phono mic inputs. 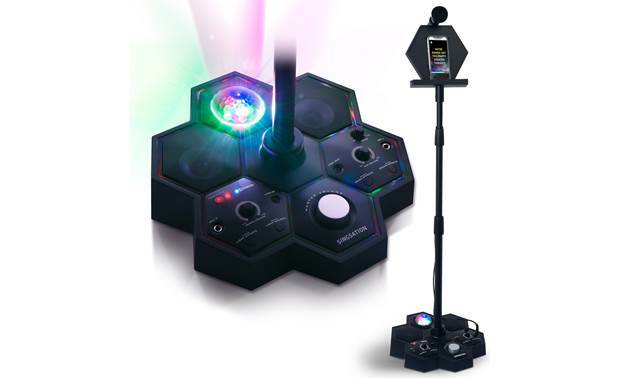 Overview: The Singsation Performer Deluxe is an all-in-one karaoke system that includes a Bluetooth mixer/speaker, microphone, and stand; combining light, sound, and voice effects while delivering dynamic full-range audio along with a light show. 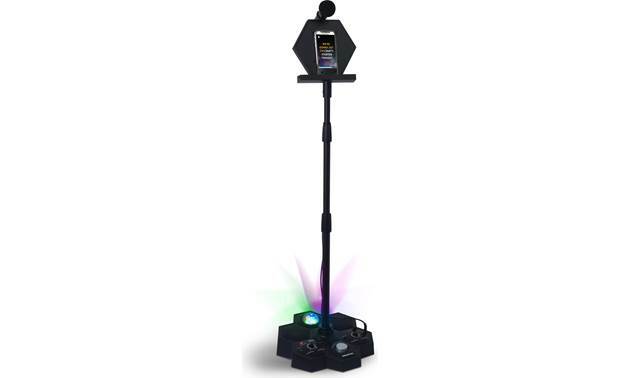 The Singsation is ideal for solo performances, parties, and outdoor entertainment. 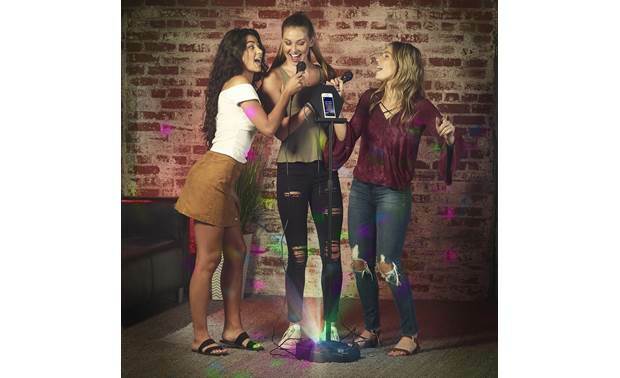 Bluetooth: The Singsation Performer Deluxe can stream music wirelessly from your Bluetooth enabled smartphone or tablet, letting you sing along to your favorite tunes. When the unit is first powered on, the Bluetooth LED will blink, indicating it's ready to pair. After selecting Singsation from your device, the Bluetooth LED will go solid and the unit is ready to stream music. 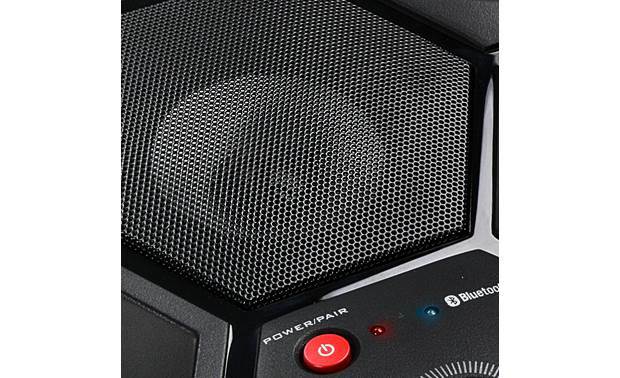 A quick double-press of the Power button will put the unit into Pairing mode. Microphone: Included with the Singsation Performer Deluxe is a wired dynamic microphone. The built-in 80" cord allows plenty of room to move around while singing and the mic features a convenient On/Off switch. Two strips of Velcro are provided for securing the microphone cable to the stand. Inputs: Along with streaming music from a Bluetooth device, the Singsation includes two 3.5mm Line Inputs for plugging portable players directly into the top control panel. The control panel also includes two 1/4" microphone inputs for plugging in the included microphone along with an additional mic (sold separately), allowing two people to sing at the same time. Power: Pressing and holding this button powers the Singsation Performer Deluxe on/off. A quick double-press puts the unit in Pairing mode. 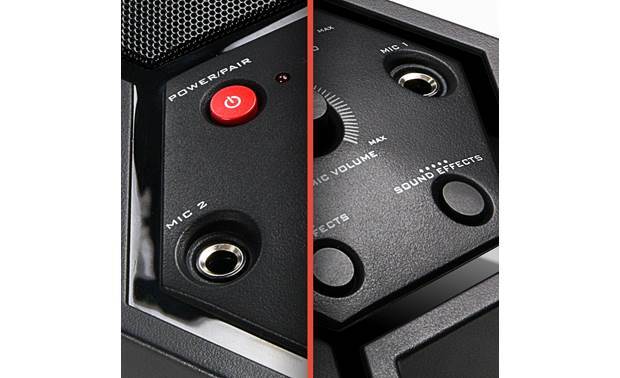 Master Volume: This control adjusts the combined volume of both mic inputs and the music. Music Volume: Adjusts the volume of the playback music, both Aux and Bluetooth. Mic Volume: Adjusts the volume of both Mic 1 and Mic 2 input signals. Echo: Adjusts the amount of Echo added to the Mic inputs. Voice FX: Cycles through the 10 available voice effects: Paging, Performance, Barbershop Quartet, Harmonizing Girls, Alien Low, Alien High, Chipmunk, Baritone, Helium, and Ghost. Sound Effects: Cycles through the 8 sound effects including Air Horn, Cheers, DJ Scratch, and more. Light Effects: Cycles through the 16 different multi-color light modes including Party, Pulse, Breathe, Chill, Dance, and more. These will vary from a constant color to different colors pulsing, fading, and flashing at different intervals. Light Color: This button works in conjunction with the Lighting Effects button, with each press changing the lighting to a different color or colors depending on what Light Effect is selected. Stand: The Singsation Performer Deluxe includes a convenient adjustable stand for both your Bluetooth device and the included microphone. The telescoping stand threads into the provided socket on the base and then attaches to the device cradle with the locking knob. The device cradle height can be adjusted from 24" up to 56" above floor level. The 7" wide device cradle is large enough to accommodate just about any smartphone or tablet and features a built-in holder for the included microphone. Device Cradle Height: Adjustable from 24" to 56" above floor level. Can I add Bluetooth speakers? Sorry, no. The Singsation comes with it's own speaker. 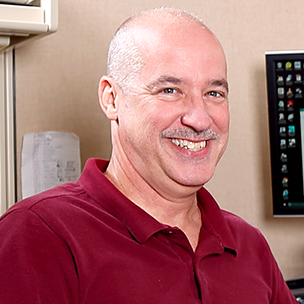 While it can receive Bluetooth transmitted to it from your smartphone or tablet, it cannot transmit to additional Bluetooth speakers. 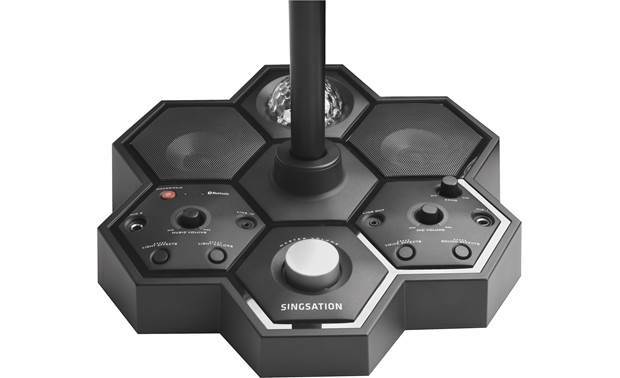 Searches related to the Singsation Performer Deluxe karaoke system with Bluetooth® speaker, microphone, and stand.